Orca Gold Commences 2,500m Drill Pr | Orca Gold Inc.
VANCOUVER, BRITISH COLUMBIA--(Marketwired - Dec. 12, 2017) - Orca Gold Inc. (TSX VENTURE:ORG)("Orca" or the "Company") is pleased to announce the commencement of drilling on the Morondo Permit in Côte d'Ivoire. Orca Gold Inc. (TSX VENTURE:ORG) is a Canadian resource company focused on exploration opportunities in Africa. 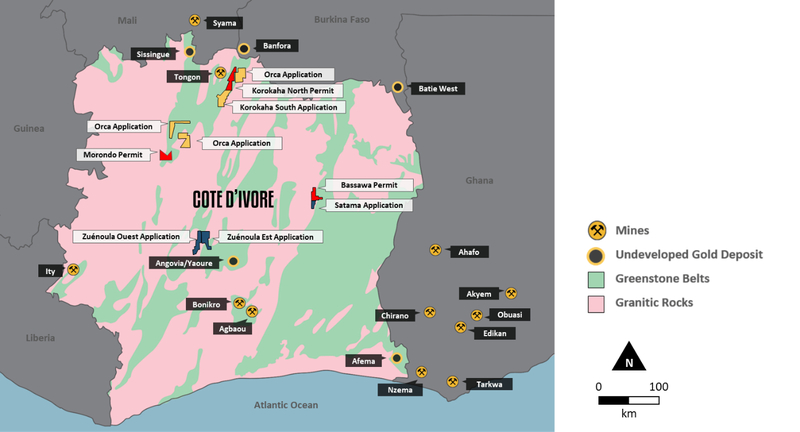 The Company is focused on its flagship 70%-owned Block 14 Gold Project in the Republic of the Sudan and an expanding exploration portfolio in Côte d'Ivoire. Block 14 is situated on a 2,170 km2concession. The Company is currently conducting a Feasibility Study on the project, which is scheduled for completion in early Q2 2018. 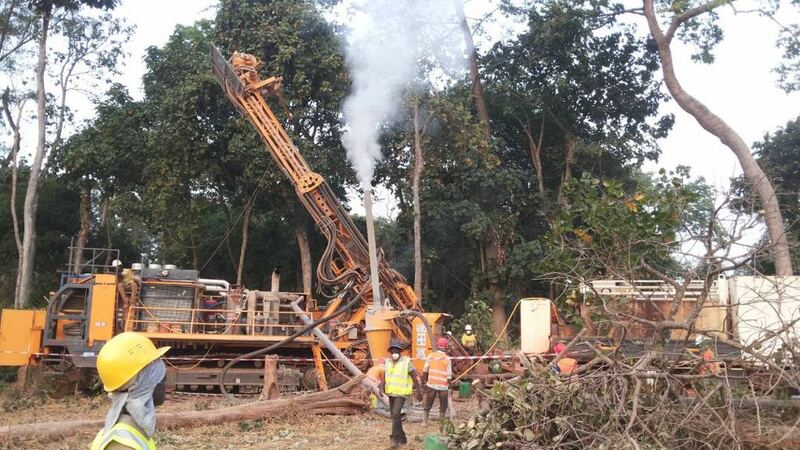 Additionally, Orca is actively conducting gold exploration in Côte d'Ivoire. The technical contents of this release have been approved by Hugh Stuart, BSc, MSc, a Qualified Person pursuant to NI 43-101. Mr. Stuart is President of the Company and a Chartered Geologist and Fellow of the Geological Society of London. Samples used for the results described herein are prepared and analyzed by fire assay using a 50 gram charge at the Bureau Veritas in Abidjan in compliance with industry standards. Field duplicate samples are taken and blanks and standards are added to every batch submitted. This press release contains forward-looking information and forward-looking statements within the meaning of applicable Canadian securities laws, including statements regarding Orca's (the "Company", the "Corporation", "we" or "our") plans and expectations relating to the Block 14 project ("Block 14") in northern Sudan, the Feasibility Study ("FS") currently being completed and/or conducted by the Corporation, exploration plans at the properties covered by the share purchase agreement with Kinross, and closing of the transaction contemplated by the share purchase agreement with Kinross and the timing and/or completion thereof. These statements relate to analyses and other information that are based on forecasts of future results, estimates of amounts not yet determinable and assumptions of management. Statements concerning mineral resource estimates may also be deemed to constitute "forward-looking statements" to the extent that they involve estimates of the mineralization that will be encountered if the property is developed. The assumptions, risk and uncertainties outlined below are non-exhaustive. Should one or more of these risks and uncertainties materialize, or should underlying assumptions prove incorrect, actual results, performance or achievements of the Corporation, or industry results, may vary materially from those described in this press release. Forward-looking statements and forward-looking information are not guarantees of future performance and are based upon a number of estimates and assumptions of management at the date the statements are made including without limitation, assumptions about the following (the "Forward-Looking Factors"): receipt of all necessary regulatory approvals; future prices of gold and other metals; successful exploration, development, and production of Block 14; the timing and completion of the DFS; the timing and likelihood of a production decision; performance of contractual obligations by counterparties; operating conditions; political stability; obtaining governmental approvals and financing on time; financial projections and budgets; obtaining licenses and permits; government regulation of the Corporation's mining activities; environmental risks and expenses; market conditions; the securities market; price volatility of the Corporation's securities; currency exchange rates; foreign mining tax regimes; insurance and uninsured risks; financial projections and results; competition; availability of sufficient capital, infrastructure, equipment and labour; dependence on key personnel; dependence on outside parties; conflicts of interest; litigation; land title issues; local community issues; estimation of mineral resources; realization of mineral resources; timing and amount of estimated future production; the life of Block 14; reclamation obligations; changes in project parameters as plans continue to be evaluated; and anticipated costs and expenditures and our ability to achieve the Corporation's goals. While we consider these assumptions to be reasonable, the assumptions are inherently subject to significant business, social, economic, political, regulatory, competitive and other risks and uncertainties, and contingencies, many of which are based on factors and events that are not within the control of the Corporation and there is no assurance they will prove to be correct.